It’s been a rather Cinderella season for the New York Rangers, who rode their improving young core, particularly on defense, to their most successful season since they won the Stanley Cup in 1993-94. Marion Gaborik eclipsed 40-goals for the third time and is the most dangerous Rangers forward. Ryan Callahan (29 goals) is the most complete player on the team and is a Selke Candidate this year. Brad Richards scored some key goals during the season, but his 66 points and -1 were somewhat disappointing. For all the hype over Henrik Lundquist’s performance this year, since March he’s been rather pedestrian (2.60 goals against; .895 save percentage). Nonetheless, this is the strongest blueline (highlighted by career years from Dan Girardi, Ryan McDonough and Michael Del Zotto) Lundquist’s ever played behind. Speaking of Cinderella seasons, the Senators were destined for a lottery pick according to most pre-season prognostications. Coach Paul Maurice brought the offense from his stint in Detroit, but more importantly the emergence of Erik Karlsson transformed Ottawa into one of the most dangerous teams in the league. Leading the attack upfront was Jason Spezza, who played 80 games for the first time in three years and was among the league-leaders in scoring. Craig Anderson actually improved as the season went along, helping the team almost shave half-a-goal against per game off their record post All-Star Game. This is a very young team though, and Anderson will have to come up huge if the Sens are to have a chance in the series. The Rangers will need their best offensive player to have a terrific post-season if the team has any chance of a Cup run. Gaborik’s compete-level will be tested by anOttawateam that will punish him physically every time he touches the puck. Similar to Gaborik, Karlsson is the straw the stirs the Senators offensive drink. The Rangers are going to go after Ottawa’s young quarterback defenseman and make him pay the price every time he goes back for the puck in his own zone. 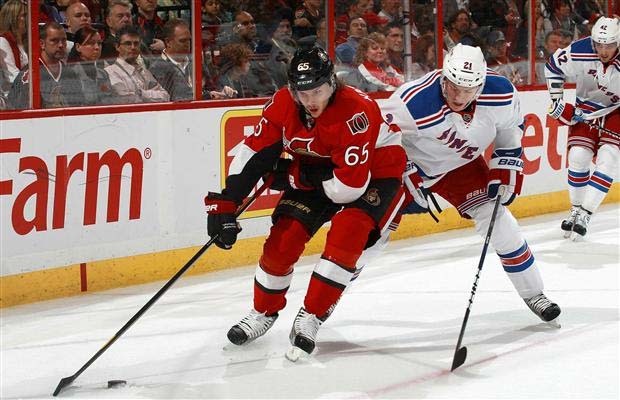 If Rangers such as Brandon Dubinsky are successful limiting Karlsson, they’ll neutralize Ottawa’s attack. Coaching: Rangers. John Tortorella’s won a Stanley Cup and should get the match-ups he wants with home-ice advantage. Goaltending: Rangers. As strong as Anderson played this season few goalies are in Lundquist’s league. Defense: Rangers. Despite improved play from Filip Kuba and Karlsson’s excellence, New York’s blueline has greater depth and is augmented by a strong two-way forward group. Scoring: Senators. Top-4 in the league scoring-wise, and only one of three teams to average more than three goals-per-game after the All-Star break. Special Teams: Even. Ottawa’s stronger on the powerplay, while the Rangers were among the league’s best on the penalty kill. The defending champion Boston Bruins were tied with Ottawa for the second-fewest points among playoff teams in their last 41 games (45 points). Poor goaltending was a major factor, as while the Bruins reduced their shots against after the All-Star Game, their goalies could only muster a .899 save percentage. Nonetheless, this is a team that’s arguably as deep as the Cup winners last year, with Tyler Seguin (team-leading 67-points) having replaced Mark Recchi; Brian Rolston playing the Rich Peverley role (15 points in 21 Bruins games) and Joe Corvo filling the Tomas Kaberle position as “offensive defenseman who needs his ice-time well-managed.” Nathan Horton’s injury has been somewhat off-set by improved play by Benoit Pouliot. A repeat is not out of the question. If there is a playoff team that would like to forget its regular season it’s the Washington Capitals, who went from pre-season favourites to run away with the Southeast Division to coming this close to finishing outside the playoffs. The firing of Bruce Boudreau brought Dale Hunter back to the Washington franchise, but the team really didn’t improve their play. The Caps were 30-23-7 under the new coach and, for the first time in years, struggled to find any offense. Hunter’s system (or lack thereof) was criticized by his own players, and a war-of-words between Roman Hamrlik and his coach added to speculation Hunter was in-over-his-head at the NHL level. Tomas Vokoun (currently suffering from a groin injury) was roughly league-average in goal, which didn’t help matters. In reality though, part of Washington’s problem was directly tied to their lack of offensive depth, particularly in the wake of Niklas Backstrom’s absence due to concussion. With Backstrom back, this is a Caps team that enters the playoffs with a few gamebreakers (Alex Ovechkin, Alex Semin, Backstrom), a strong commitment to defense and an improved blueline (Mike Green’s play has fallen off a cliff, but John Carlson and Dmitri Orlov have stepped up). The pieces are there for this team to surprise… or leave the post-season after four-straight losses. Boston’s veteran goalie has been rather average in 2012. If he can’t find his game now, the Capitals will stick around longer than many people think. He is the most talented player in this series and a match-up against Zdeno Chara should be incredibly challenging. But Ovechkin, rather quietly, has been terrific down the stretch (12 goals in 19 games) and has Backstrom back as his centre. A special effort by Ovechkin could re-write this Capitals season and give the Bruins fits. Coaching: Bruins. This is Hunter’s first trip to the NHL post-season; Boston’s Claude Julien is among the league’s best. Goaltending: Bruins. Closer than you might think given Tim Thomas’s struggles. Who knows how Vokoun will play – and if he’ll play – meaning it’ll be up to Michael Neuvrith or Braden Holtby to shock the world. Defense: Bruins. Washington potentially has more blueline talent but the Bruins are a more complete and effective group, both forwards and defense. Scoring: Bruins. Dale Hunter hasn’t been able to get Washington’s offense firing, while the Bruins can roll four scoring lines. Special Teams: Bruins. Slight edge due to stronger penalty killing. The Florida Panthers enter these playoffs as the lowest scoring team in the Eastern Conference. Historically, teams with the fewest goals to reach the playoffs usually make quick first-round exits. Furthermore, the Panthers enter the post-season with the worst goal differential remaining – another ominous omen. Having said that, there are a few reasons why Florida won the Southeast Division. For starters, the Panthers have received solid goaltending from both Jose Theodore and Scott Clemmensen. More importantly, Brian Campbell (52 points) had a renaissance and Jason Garrison (16 goals) had a career year, helping to turn a below-average blueline into a decent group. Florida also got great mileage from its top line of Tomas Fleischmann, Stephen Weiss and Kris Versteeg, although they tailed off as the season wore on (Versteeg had just 4 goals after the All-Star Game). Coached by former Panthers bench boss Peter DeBoer, the Devils implemented a more aggressive system this season to strong results. Nowhere was this more impressive than on the penalty kill, where New Jersey led the league with 15 shorthanded goals. Ilya Kovalchuk had his best season from a complete player perspective, leading the team in goals, points, ice-time and playing a penalty killing role. David Clarkson (30 goals), a healthy Zack Parise (31 goals), Patrick Elias (78 points) Petr Sykora (21 goals) and rookie Adam Henrique (51 points) have given New Jersey more scoring depth than they’ve had in years. This depth upfront hasn’t translated to the defense however, as the Devils blueline is much like Easter Island (aka a bunch of statues). Rookie Adam Larsson led defenseman in scoring with 18 points but has found himself a healthy scratch down the stretch. There’s a lot of pressure on Marek Zidlicky to be a powerplay quarterback in the post-season. Not only is Campbell likely to play more minutes than anyone else in the series (outside of the goalies), but he’ll be asked to contribute at both ends of the ice. If Florida wins the series the powerplay – on which Campbell is the quarterback – will have to be a factor. Similarly, it would not be a surprise to see the smooth-skating Campbell matched-up against Ilya Kovalchuk, in the hopes that speed can counteract speed. Brodeur isn’t the goalie we all remember, but his numbers and play did improve as the season went along (.921 save percentage after the break). And yet, he hasn’t won a playoff series in five years. Poor play from Brodeur is probably the only way the Panthers can win this series. Coaching: Even. Both teams are led by coaches in the playoffs for the first time. Both did good jobs in the regular season. Goaltending: Even. Brodeur and the Devils goaltending were much improved in the second-half, but Florida’s Jose Theodore and Scott Clemmenson were just as strong all year for the Panthers. Defense: Even. The Panthers blueline is stronger than that of the Devils, but New Jersey’s system and team approach to defending the goal remains elite. Scoring: Devils. Florida scored only 2.29 goals-per-game after the All-Star break, worst among playoff teams. Special Teams: Devils. Florida was 7th on the powerplay but 25th on the penalty kill. New Jersey was 1st overall on the penalty kill and 14th on the powerplay. There’s a lot of hype about the Penguins as they enter the playoffs, and the buzz is legitimate. Pittsburgh played at a 60-win, 315-goal pace in the second half of the season, and enter the playoffs relatively healthy. There may not be another team in the league more equipped to transition from an attack-focused approach to a defensive one than the Penguins. Evgeni Malkin (109 points) is this year’s likely Hart Trophy winner, and there were times he simply dominated opponents in the offensive zone. His chemistry with James Neal (40 goals) might be the best in the league. Given reduced ice-time upon his return from a concussion, Sidney Crosby also dazzled, putting up 37 points in 22 games this season. When you add Jordan Staal (25 goals) to the mix, this is the deepest team at centre in the league. It’s also the most fragile, as each of Staal, Crosby and Malkin have battled injuries in the past. An injury to Malkin or Crosby especially could change the fate of any playoff series. On defense, Kris Letang battled injuries all season but when healthy looked like a Norris candidate. Brooks Orpik and Zbynek Michalek are a strong shutdown pairing. Despite major changes in the off-season, it was really business as usual for the Flyers, who reached 100 points for the second-straight year. Team success was predicated on offense, as Philadelphia was one of just three teams to average more than three goals-per-game. Claude Giroux was a major reason for the team’s offense, establishing himself among the league’s elite scorers with 93 points. Having said that, a strong rookie campaign from Matt Read (24 goals) and a breakout season for Scott Hartnell (37 goals) helped give the Flyers three solid scoring lines. Rookie Sean Couturier played the shutdown centre role all season, and it will be interesting to see how he fares in that role during the playoffs. On defense, the addition of Nicklas Grossman gave the Flyers the capable defensive-defenseman they didn’t have once Chris Pronger was lost for the year (career?) due to injury. Kimmo Timonen (43 points) also took on a greater role after Pronger’s injury, and played some of the best hockey of his career. In goal, Ilya Bryzgalov and Sergei Bobrovsky were the subject of criticism all season, but their play improved substantially after the All-Star Game. There’s every reason to expect this Penguins and Flyers series will get ugly. Cooke (19 goals) has had a terrific year, introducing self-control into his game and becoming an effective checking line player. If Cooke can play like Esa Tikkanen, acting as a defensive pest but staying above the expected Flyers shenanigans, he could drive Philadelhpia crazy and into a march to the penalty box. As much pressure as there will be on Ilya Bryzgalov’s shoulders, Jaromir Jagr is the key veteran presence in this young Flyers dressing room. Jagr battled groin injuries during the second-half of the season but demonstrated at times he can still dominate play, particularly down low in the offensive zone. The Flyers can’t win this series if Jagr is a passenger – they need him to be a catalyst. Coaching: Even. Both are Stanley Cup winners; both are among the best in the game. Goaltending: Even. Statistically, Philadelphia received better goaltending from its netminders than Pittsburgh did this year. The Penguins’ Marc-Andre Fleury has become somewhat of a modern day Grant Fuhr – a big game goalie whose statistics otherwise seem unremarkable. Defense: Penguins. The Penguins have proven without Crosby or Malkin they can be an elite defensive team in the NHL. The Flyers would rather trade chances with their opponent, and their blueline isn’t nearly as deep. Offense: Penguins. Despite some impressive scoring depth on the Flyers roster the Penguins, with Crosby and Malkin, offer a Lemieux-Francis, Gretzky-Messier, Forsberg-Sakic –like twosome. Containing both of them will be impossible. Special Teams: Penguins. The Penguins are top ten on both the powerplay and penalty kill, while Philadelphia’s penalty kill has been bottom-third of the league. Sorry Sens fans..that should read Paul Maclean, not Paul Maurice. That’s what you get for drinking while you write I suppose ;). You’ve obviously been hanging out with J.J. too much.